On Monday, July 16, 2018, Louis Cogan passed away peacefully in his home at the age of 83 surrounded by his family. Predeceased by his parents David and Bertha Cogan, he is survived by his wife of 57 years Marcia (nee Katz), his children Susan (Yair Shachar-Hill), Karen (Neil Grahn), Joel (Jessica Cogan) and his grandchildren, David, Essie, Sydney, Becca, Rachel, Lauren, and Benjamin; brother Harvey Cogan (Nessie), sister Leya Tapper (Bernie), sister-in-law Adrienne Katz and many nieces and nephews. Lou was born March 18, 1935 in Winnipeg, Manitoba and grew up in Thunder Bay, Ontario, in what was then Fort William. He worked in a grocery store at the age of 15 and at 17 worked night shift at the Abitibi Paper Mill in Port Arthur. On Saturdays he worked up to 14 hours a day at Safeway as a bagger. As a young man, he worked as a door-to-door salesman with his brother Harvey selling Fuller Brushes to save money for university. He moved to Toronto to attend Dental School at the University of Toronto where he was an honour student and lived at the Alpha Omega Jewish Fraternity House. After graduating from Dentistry, he moved to Winnipeg in the fall of 1958, practicing for a short time in Emerson Manitoba. He then spent nearly 40 years running highly successful dental practices in Windsor Park and on Marion Street in Winnipeg. Over the years he was actively involved as a member of the Manitoba Dental Society, the Winnipeg Dental Society and the Alpha Omega Fraternity serving as president and as regent. He retired from dental practice in 1996 and focused on real estate and business endeavours. Lou lived life to the fullest and enjoyed playing tennis and golf with friends at Glendale Country Club and schmoozing at The Asper Campus. He loved travel, fishing trips, spending time in Scottsdale, hockey games, listening to music of all kinds, and spending good times with family and dear friends. 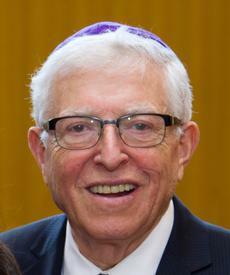 The seeds of Jewish community involvement were planted in Young Judea and later he served as the President of the local chapter of Technion. An active participating member of the Shaarey Zedek Synagogue, he was a Zionist and a strong supporter of the State of Israel visiting many times with his wife Marcia and taking his beloved father on two special occasions. He was dedicated to canvassing for Jewish causes and Israel and gave generously to both the Jewish community and the community at large. On September 28, 2004 he ensured his legacy would continue in perpetuity becoming a signer in the Endowment Book of Life for the Jewish Foundation of Manitoba. Family was everything to Lou and his love was returned in full measure. He was grateful to celebrate all his grandchildren’s B’nai Mitzvot and it was a lifetime highlight for him to celebrate his own second Bar Mitzvah at the age of 83. The family gratefully appreciates the loving support of Heather Tapper, Hart Poskar, Lara London, and Rhiannon Boyko, and wishes to thank the many professionals who supported Lou through all his medical challenges including Chuck and Glenn from Meyers Drugs, the Heart Failure Clinic, Drs. Marvin Slutchuk, Pamela Katz, Grant Goldberg, Mark Clarke, Paul Komenda, Mel Bottner, and the Palliative Care Team. We are grateful for his kind and dedicated caregivers Rose Ruperto, Lynn Carmichael, Cherry May Pellegrino and Chris Ruedas. Most especially, Lou relied on his nighttime caregiver Elvin Pellegrino, who went above and beyond to support Lou in every way possible. Funeral services were held at the Shaarey Zedek Synagogue on Wednesday, July 18, 2018 at 2 pm. Pallbearers were Joel Cogan, Neil Grahn, Danny Hamburg, Hart Poskar, Yair Shachar-Hill and Norman Shore. Honourary Pallbearers were Zivie Chudnow, Jeff Koplovitch, David Shachar-Hill, Frank Short and Bernie Tapper. Lou’s life was a life well lived. He will forever be missed and will always be remembered with love. In lieu of flowers, donations in honour of Lou can be made to the The Louis and Marcia Cogan Family Trust Fund through the Jewish Foundation of Manitoba (204)477-7520.